The purpose of the ASCA Stockdog Program is to preserve and promote the instinct of the Australian Shepherd to be a versatile stockdog. The program showcases, preserves, encourages, retains, challenges, and rewards the working Australian Shepherd through the use of certification programs and challenging trialing disciplines on several classes of stock. The first sanctioned trial was held in Santa Rosa, California in 1974; in 1986, the program was expanded to allow titling of other breeds. The core of the ASCA trialing system is comprised of three divisions: Started Trial Dog (STD), Open Trial Dog (OTD), and Advanced Trial Dog (ATD). Each division is divided into three classes: Ducks/Geese, Sheep/Goats and Cattle. Small letters c, s, or d after the title indicate the stock on which the title was earned. A Working Trial Champion title is awarded to those dogs who have received ATD titles in all three classes of stock. 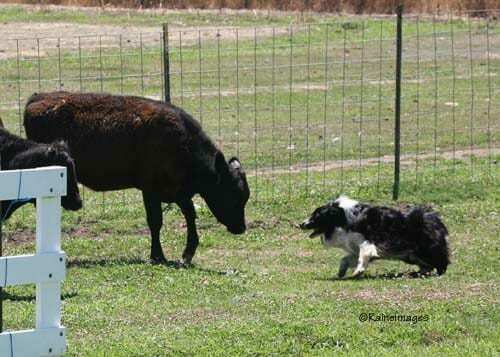 Also offered are a Post Advanced Trial Dog (PATD) division which runs sheep or cattle on a bigger course, a Ranch Trial Dog (RTD) division (sheep or cattle, ten-head minimum) which includes ranch work such as sorting, penning, etc. and a Farm Trial Dog(FTD, open and advance division) which includes farm work such as loading trailers, sorting, penning, working chutes etc. The Started, Open, and Advanced Trial Dog titles, as well as Post Advanced and Farm Trials, require 2 qualifying scores. If you have suggestions for the ASCA Stockdog Program, please contact a Stockdog Committee member and they will be happy to take your suggestion to the committee.